Home Video Drills: O-Line - How to Block Down? Drills: O-Line - How to Block Down? Legendary football coaches like Knute Rockney and Vince Lombardi designed running plays to result in touchdowns from anywhere on the field. Yet if a running play nets a gain of 5 yards, it’s an offensive victory. A football running play is taken through a hole, or around the end on one side of the quarterback. 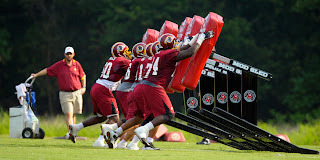 The offensive linemen on the other side are assigned to keep the defensive players opposite them away from the action. The way they do it is to "block down." 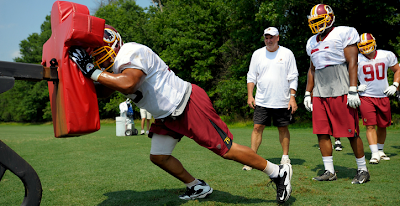 Blocking down is one of the first blocking techniques an offensive lineman learns. That being the case, it’s only proper to include some blocking basics. Consider the field from the quarterback’s perspective. The right guard lines up directly to the right of the center, and the right tackle is to the right of the right guard. A hypothetical play entails the fullback taking a handoff from the quarterback and running between the left tackle and left guard. The center, right guard and right tackle will block down--that is, they will push the defenders to their right side, to keep them away from the ball carrier. Offensive players have the advantage of knowing the snap count. As the quarterback shouts the predetermined call for the ball to be hiked, get a jump on the defender you’re assigned to block by taking the first step. The play scripted in step 1 assigns three players to block down to their right. The right guard, for instance, will want to move his left foot forward, between the opposing defensive lineman and the center. This sets up positioning to block down. To block down to the right, your right shoulder should be against the defender’s chest. After taking the first step, place the right side of your head beside the defender’s torso, and put your right forearm in front of his abdomen. Use the left foot you positioned initially to push toward the right. Pump your knees and step to this direction as you push the player away from the quarterback. This gives the quarterback time to hand off and the fullback time to get through the hole with the ball. Your job is to keep the defender you’re assigned to from interrupting the play, or making a tackle. Stay against his body and continue to push him away from the developing play. If he falls, you’re free to run down the field and execute another block, or possibly recover a fumble. Contribute your effort to the play until you hear a whistle. Being an effective lineman involves being able to read other players' body movements and reacting to them correctly. Prior to the snap, examine the opposing lineman's stance and the direction she is facing to get a read on where she is going to be blocking. The motion and direction of players in the backfield, whether offensive or defensive, gives you clues on which direction the play is going so you can be proactive and be in the right position to make a good play.